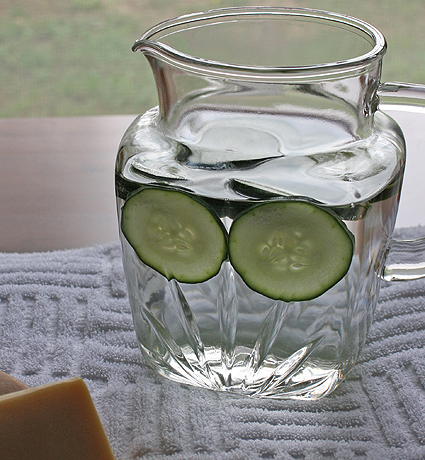 FoodBasics101: Spa Water Recipes- Cucumber Water...unique and refreshing. Spa Water Recipes- Cucumber Water...unique and refreshing. Recently I visited the Austin Springs Spa in Johnsonville, Tennessee. During my stay I was offered a variety of spa waters for relaxation and rehydration. The cucumber water was my favorite, clean-tasting and refreshing. Fruits and vegetables: slices of lemon, orange, grapefruit, lime, honeydew melon, or cucumber. Herbs: sprigs of mint or rosemary, slightly crushed; slices of ginger root. Cucumber water would be a perfect beverage for a wedding shower, bachelorette party, or any summer celebration. Float thin rounds of cucumber in a pitcher of chilled water several hours or overnight. Serve slightly chilled. Place a cucumber slice in each glass before serving. I really do need to keep a pitcher of this in my refrigerator - I am so impressed whenever a restaurant serves water like this, but I've never made it myself! What a great way to cool off in the summer!